(Nanowerk News) In a study led by the University of Leeds and published in the journal Nature ("Beating the Stoner criterion using molecular interfaces"), researchers detail a way of altering the quantum interactions of matter in order to "fiddle the numbers" in a mathematical equation that determines whether elements are magnetic, called the Stoner Criterion. Co-lead author Fatma Al Ma'Mari, from the School of Physics & Astronomy at the University of Leeds, said: "Being able to generate magnetism in materials that are not naturally magnetic opens new paths to devices that use abundant and hazardless elements, such as carbon and copper." Magnets are used in many industrial and technological applications, including power generation in wind turbines, memory storage in hard disks and in medical imaging. "Future technologies, such as quantum computers, will require a new breed of magnets with additional properties to increase storage and processing capabilities. Our research is a step towards creating such 'magnetic metamaterials' that can fulfil this need," said Al Ma'Mari. Yet, despite their widespread use, at room temperature only three elements are ferromagnetic -- meaning they have high susceptibility to becoming and remaining magnetic in the absence of a field, as opposed to paramagnetic substances, which are only weakly attracted to the poles of a magnet and do not retain any magnetism on their own. These ferromagnetic elements are the metals iron, cobalt and nickel. Co-lead author Tim Moorsom, also from the University's School of Physics & Astronomy, said: "Having such a small variety of magnetic materials limits our ability to tailor magnetic systems to the needs of applications without using very rare or toxic materials. Having to build devices with only the three magnetic metals naturally available to us is rather like trying to build a skyscraper using only wrought iron. Why not add a little carbon and make steel?" The condition that determines whether a substance is ferromagnetic is called the Stoner Criterion. It explains why iron is ferromagnetic while manganese is not, even though the elements are found side-by-side in the periodic table. The Stoner Criterion was formulated by Professor Edmund Clifton Stoner, a theoretical physicist who worked at the University of Leeds from the 1930s until the 60s. At its heart, it analyses the distribution of electrons in an atom and the strength of the interaction between them. It states that for an element to be ferromagnetic, when you multiply the number of different states that electrons are allowed to occupy in orbitals around the nucleus of an atom -- called the Density of States (DOS) -- by something called the 'exchange interaction', the result must be greater than one. The exchange interaction refers to the magnetic interaction between electrons within an atom, which is determined by the orientation of each electron's magnetic 'spin' -- a quantum mechanical property to describe the intrinsic angular momentum carried by elementary particles, with only two options, either 'up' or 'down'. In the new study, the researchers have shown how to change the exchange interaction and DOS in non-magnetic materials by removing some electrons using an interface coated with a thin layer of the carbon molecule C60, which is also called a 'buckyball'. The movement of electrons between the metal and the molecules allows the non-magnetic material to overcome the Stoner Criterion. Dr Oscar Cespedes, principal investigator of the project, also from the University's School of Physics & Astronomy, said: "We and other researchers had noticed that creating a molecular interface changed how magnets behave. For us, the next step was to test if molecules could also be used to bring magnetic ordering into non-magnetic metals." The researchers say that the study has successfully demonstrated the technique, but that further work is needed to make these synthetic magnets stronger. "Currently, you wouldn't be able to stick one of these magnets to your fridge. 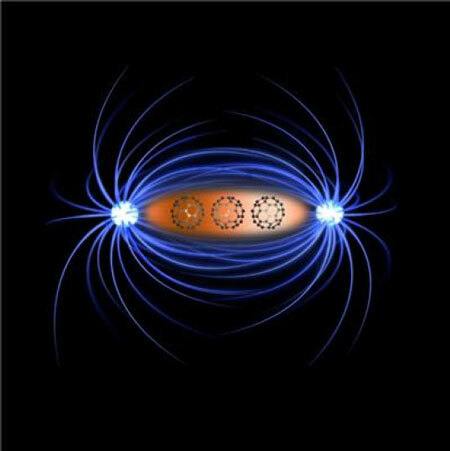 But we are confident that applying the technique to the right combination of elements will yield a new form of designer magnets for current and future technologies," said Dr Cespedes.